For years UK victims of overseas terror attacks and their families have battled to get compensation. Now a man whose son was killed in the Sharm al-Sheikh bombings in July 2005 is calling for campaign groups to join together to lobby the government. 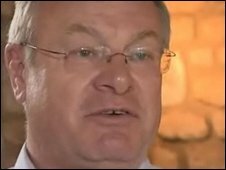 Four years ago Trevor Lakin's life was torn apart when his son was killed in a terrorist attack in Egypt. Jeremy Lakin, 28, and his girlfriend Annalie Vickers were among 11 Brits killed in the bomb blasts, while they were on holiday in the resort of Sharm al-Sheikh. Since then Mr Lakin, from south Lincolnshire, has actively campaigned for better treatment of victims of international terrorism. Currently the UK government does not guarantee compensation for people injured in attacks abroad. Victims of the 7 July bomb attacks in London received money from the Criminal Injuries Compensation Authority. But those hurt outside the UK are not eligible. It is a situation which angers many, as other countries such as Australia, France and Israel have schemes in place offering financial support for their citizens. Mr Lakin, 60, says he is not interested in gaining money for his family, but wants to raise awareness of the plight of people affected by terror attacks. He is currently attending a conference in Turin, Italy, to speak about the rights of victims with Foundation for Peace, a charity set up by the family of Tim Parry, who was killed in the IRA bombing of Warrington in 1993. Many who survive bomb blasts require expensive care for the rest of their lives, but often have to find the money themselves. Mr Lakin, and many others, believe this is an injustice. "Jack Straw has announced he has set up a working group for victims of overseas terrorism," he said. "It's seven years late, Bali victims [hurt in the 2002 bombing] still aren't getting anything. "If we can use one organisation to represent everyone then that would be great." Will Pike, 29, from Camden, north London, was injured in last year's Mumbai attack and left paralysed from the waist down. He has been offered £15,000 from a British Red Cross aid fund and his family is now raising money to help him rebuild his life. Mr Pike said: "Because we were British nationals we were targeted. We had holiday insurance but they don't cover terrorism." "Surely there has got to be a look at the change in policy for British people for when they go on holiday and are affected by terrorism?" Mr Lakin has spoken to the Pike family and many other victims and their families who have suffered in atrocities, including the Bali bombings. "My son is never coming back. I'm not putting myself up for glory, the next time something happens I don't want the guilt, knowing full well what people are going to go through, and knowing I did nothing about it," Mr Lakin said. "There's no coordinated response to give the individuals all the support they need and when they need it. "I think getting us all around the same table as one voice would have a bigger impact." Sue Cooper, from Folkestone, Kent, whose brother Paul Hussey died in the Bali bombings, said she believed people killed or hurt in the atrocity and their families were "forgotten" victims of terrorism. "No one ever seems to mention Bali and there were 28 Brits killed," she said. "We have suffered badly health-wise and it all stems back to the stress we've had and my business suffers. "We have got to get strength in numbers." 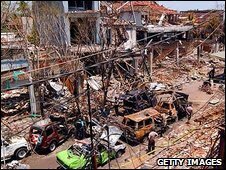 Lawyer Jill Greenfield, a partner at Field Fisher Waterhouse, represents five people hurt in the Kusadasi bombing in Turkey, in July 2005. She said: "I understand the government is very much on board [to set up a compensation scheme], the problem is sorting out the finances. "[British tourists] are easy targets. We need a final push to get this sorted out." A spokeswoman for the Department for Culture Media and Sport said: "The government has taken a number of steps to provide emotional and practical support to those affected. "These include the British Red Cross Charitable fund which was launched in 2007 with a Government donation of £1m. "However, we recognise that more still needs to be done to ensure that victims of terrorist incidents overseas are treated in the same way as those affected by such incidents in the UK."